Think you may need vision correction? You may be right – vision problems are probably more common than you think. According to the Vision Impact Institute, about 60 percent of the world needs some sort of vision correction. So while you are scheduling your next vision check-up, take this self-test to see if you could be in the market for new glasses or contacts soon. 1- Do you have blurry vision? Let’s test this one. Check to see if you can recognize objects up close and far away. Does it look fuzzy up close? Or is the object blurry when placed 10 feet away? If you answer yes, you may be developing near or farsightedness. 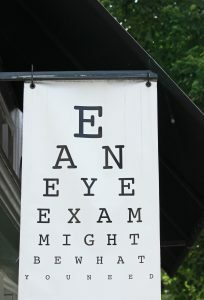 Schedule an eye exam with your vision provider to be sure. 2- Do you have trouble adjusting from dark to light? Try this out: Turn off the light and stay in a dark room for a few minutes. Then, turn on the light. Do you feel like it takes longer than usual to adjust to bright lights? If so, it could mean your eye muscles are weakening. This is a common problem with aging and can be checked out by your vision provider. 3- Do you having trouble reading on a screen (computer, phone, tablet)? After a long day of working, do you notice difficulty reading on your computer or phone? This may be a sign of farsightedness. Test yourself by reading the same thing at a distance each day. If it worsens, you may need vision correction. 4- Do you experience eye strain and fatigue? Do you have blurry vision? Are you squinting? Do your eyes feel tired? At some point, almost everyone’s eyes experience some sort of eye fatigue. Try giving your eyes a long period of rest and recovery. If it doesn’t remedy on its own, it may be a sign that you need vision correction. 5- Do you get headaches often? If you have unexplainable headaches, it may be a sign of overworked eye muscles. Specifically, the mechanism that helps the cornea and lens focus could be failing. Because of this, the small eye muscles start to work harder. Usually this can be remedied with vision correction. Talk to your vision provider to see if this is the cause of your headaches. Most of these first issues are fixed easily after an easy evaluation with your provider. But sometimes, vision problems can be a sign of something more serious. If you answer yes to any of the next questions below, it’s a good idea to schedule an appointment right away. These are problems your ophthalmologist will want to address immediately. – Do you ever get wavy vision? – Can you no longer see objects at night? – Are you experiencing double vision? – Do you see halos around objects? – Do you have excessive tearing? – Do you have a sudden decrease vision? – Do your eyes have prolonged, unusual redness?